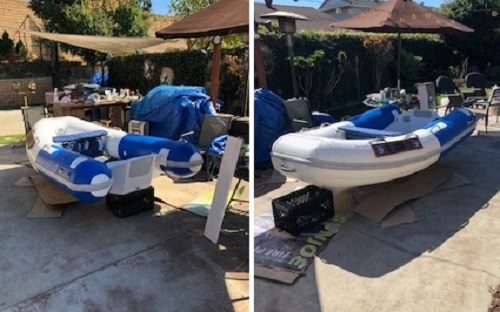 Inflatable boat repair and paint products to fix inflatable boats all in 1 location. Inflatable boat accessories, dinghy accessories, parts and products all in 1 location. Some are standard accessories that fit most inflatable boats while others are custom accessories made specifically for the inflatable boat aftermarket. These custom accessories include repair products, patch kits and glue, inflatable boat paint and internal leak sealer, launching wheels, and others. Browse the categories below to find the accessories you want. Read customer feedback and view their restored boat pictures below. Has excellent adhesion to Neoprene and Hypalon coated fabrics. Repair your boat with this tough bonding formula.